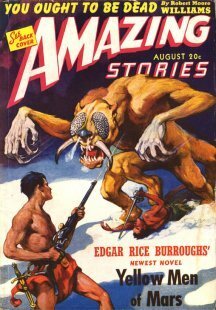 Amazing Stories pulp magazine in 1941 while ERB was living in Hawaii. 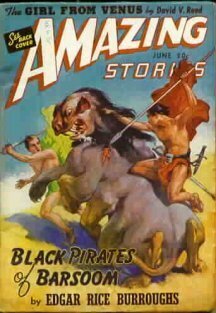 These magazine stories were illustrated by J. Allen St. John. This is without doubt one of JCB’s finest paintings, if not his very finest. It is absolutely spectacular and captures the essence of thoats in a way that places this work among the masterpieces of Burroughsian art. There is no doubt that JCB was inspired by fantastic beasts. 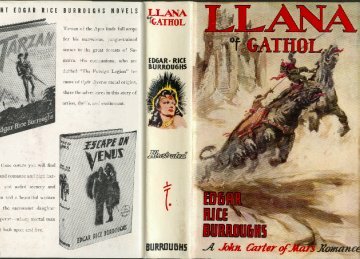 John Carter tells how he he vaulted upon a “vicious devil” who tried to buck him off, “and failing that, reached back with his huge, gaping jaws in a effort to seize me.” Carter then beat this recalcitrant thoat upon the head and snout with the flat of his broadsword until he is allowed to ride in relative peace. Finally, during the battle, “he maneuvered into the correct positions to give me an advantage in this savage duel, and when at last I had achieved a sudden advantage which had almost unseated my rival, my thoat rushed like a mad devil upon the thoat of the green warrior tearing at its throat with his mighty jaws while he tried to beat it to its knees with the weight of his savage assault.” (Chapter 3). This picture is executed with great accuracy and excitement -- a masterpiece of both masters (father and son) working together to create a memorable moment of Burroughsian story-telling and art. 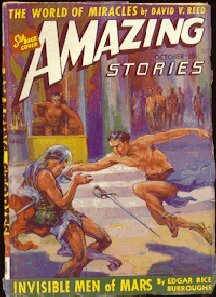 John Carter is being attacked by an ulsio, a Martian rat as large as a puma, that has just come in through a large wooden door. (Ordinarily ulsios are about the size of an Airedale terrier.) This scene is from chapter 5 of "The Ancient Dead" as revealed by the mouldering skeleton and the chests of magnificent gems. 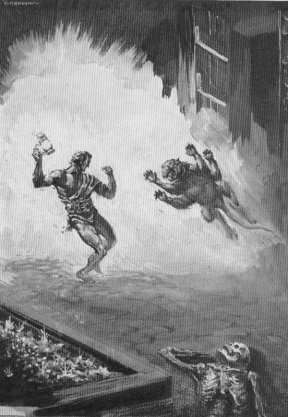 John Carter is unarmed, so he is about to bash the ulsio with a torch or lantern that shines brightly in the darkness of the pits. In chapter 12 of Book 1 “The Ancient Dead” we see the final dissolution of the ancient Orovars. 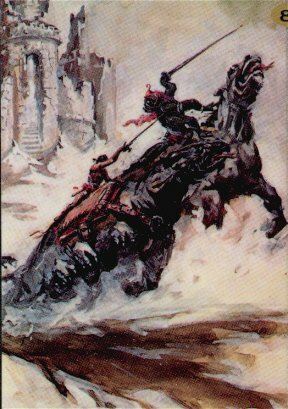 It is a startling work of fiction that covers great spans of time, and JCB’s magnificent painting evokes the passing away of all the giants of time past with a man literally turning to dust before our eyes. 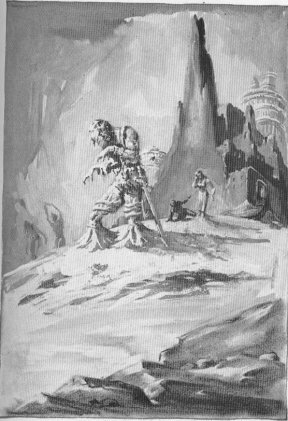 He stands before a tower that is also slowly melting away into the sands before it -- a powerful monument to the inevitability of mortality in all the races of the universe. 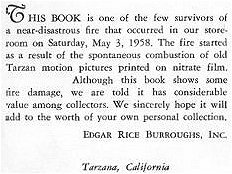 It is a haunting and tragic evocation. 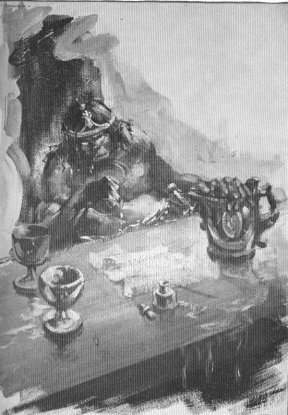 An evil warrior sits before a wooden table with one hand on a large pitcher. He is pointing to a piece of parchment upon which something has been written. 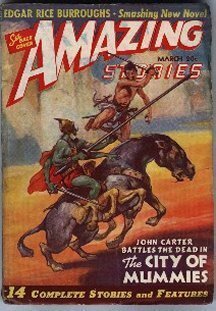 This picture might pass for Doxus, Jeddak of the First Born of Barsoom at Kamtol, who has just written “Dotar Sojat, the slave, is granted the freedom of the palace and the city.” It is a pass for John Carter because he promised to teach him all his tricks of swordsmanship. I find it to be a masterly presentation of a villain - - it literally oozes evil with the free brush strokes of paint. 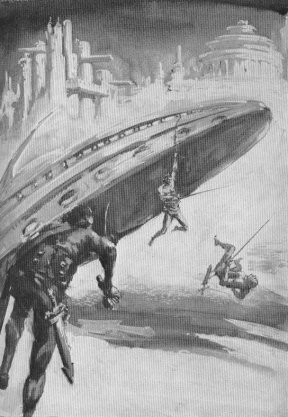 However, the tankard on the table reveals the true subject to be the drunken Phor San who signed the order that gave John Carter the command of the ship Dusar just before he passed out. Warriors battle on a flyer that is just taking off. One man hangs by one arm from a rope attached to the flyer. 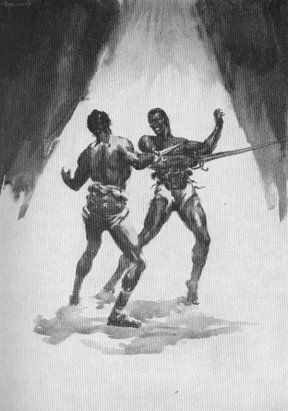 He has just defeated a man who is falling to the ground. Another warrior on the ground approaches with sword drawn from the left side of the painting. A towering Barsoomian city rises in the background.